The integumentary system (aka the skin) is directly effected by massage. The contact and friction on the skin increases body temperature.This rise in body heat dilates blood vessels and allows nutrient rich blood to reach the surface. Massage stimulates both the sebaceous (oil) and sudoriferous (sweat) glands, leading to an improvement in the overall condition of the skin, as well as the natural cooling of the body. Massage therapy isn't right for everyone, particularly individuals with certain skin conditions. In some cases massage is contraindicated, while in others the therapy can be modified to meet the needs of the client. These include, but are not limited to: acne, athlete's foot, blisters, burns, ulcers, eczema, herpes, impetigo, lice, psoriasis, ringworm, rosacea, scabies, and warts. One of the primary reasons people turn to massage is for its benefits on the muscular system. The most obvious benefits are relief of muscular tension, reduction of soreness and fatigue, and increased flexibility. 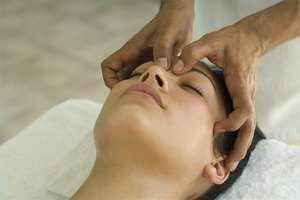 Certain massage techniques manually separate muscle fibers, resulting in reduced frequency and severity of muscle spasms. Those who receive massage consistently often find an improvement in motor skills, and increased muscle tone. This is due in part to the increased contact of muscle spindles. Benefits to the skeletal system include: increased mineral retention, stronger bones, and faster healing time for fractures (this is due to improved blood circulation massage creates). Massage has been used to aid in the treatment of a number of musculoskeletal conditions. These include fibromyalgia, hypertrophy, muscle fatigue or cramping, muscular dystrophy, shin splints, muscle strains, tendinitis, plantar fasciitis, arthritis, fractures, kyphosis, lordosis, scoliosis, ligament sprains, TMJ and whiplash. Another prime motivator for getting a massage is stress and anxiety reduction-- this is because massage works to calm the nervous system. Individuals who receive frequent massage also report reduced chronic pain, as a result of higher levels of endorphins in the body. Less pain, leads to less use of pain medications, an added bonus. Massage has also been shown to decrease beta wave activity in the brain while increasing delta and alpha wave activity in the brain. Decreased beta wave activity promotes relaxation, while increased delta and alpha waves contribute to relaxation and more restful sleep. There are several medical conditions of the nervous system that can be helped with regular massage therapy. These include: carpal tunnel syndrome, multiple sclerosis (in between flareups), nerve entrapment, Bell's and cerebral palsy, paralysis, sciatica, thoracic outlet syndrome, etc. Massage therapy triggers the release of beneficial hormones and neurotransmitters into the body. An increase in dopamine, for example, leads to reduced levels of stress or depression. Massage also increases serotonin and norepinephrine, which promote relaxation and improved mood. Massage helps to decrease cortisol levels, which leads to decreased stress and heightened immunity. While massage has an overall positive effect on the endocrine system, certain disorder of the system may call for clearance with your doctor or massage therapist before proceeding. These conditions include, but are not limited to acromegaly, Cushing's disease, diabetes, hyperthyroidism, hypoglycemia, and hypothyroidism. Massage therapy has a number of incredible benefits on the circulatory system, which extends to the lymphatic and immune systems. Massage helps to promote the circulation of lymph, a fluid belonging to the lymphatic system that helps fight infection. Massage also stimulates lymphocytes in the blood, thereby boosting immunity. Individuals with the following disorders may benefit from massage: anemia, angina, congestive heart failure, controlled hypertension, migraines (between attacks, not during), strokes (during rehabilitation), chronic fatigue syndrome, lupus (between flareups) and lymphedema. Massage therapy is believed to have a number of long-term benefits on the respiratory system. Frequent massage helps to strengthen the respiratory muscles, contributing to improved overall pulmonary function (i.e. the vital capacity of the lungs, expiratory volume, and peak expiratory flow). Massage also helps to promote fluid discharge from the lungs and reduces tension in the laryngeal region. The following respiratory conditions are known to benefit from massage therapy: apnea, asthma, bronchitis, laryngitis, and sinusitis. The digestive and urinary systems also stand to benefit from massage therapy. For the digestive system, massage helps to promote proper function of the colon, can relieve constipation and gas, and can stimulate the overall digestive process. For the urinary system, massage may help to increase urine output, while also increasing the levels of metabolic waste found in the urine, thus cleansing the body. Individuals with the following digestive and urinary conditions may benefit from massage: constipation, diverticulosis, hemorrhoids, hepatitis (after the infectious phase ends), obesity, ulcers, gout (after the acute phase), and urinary incontinence.